In June 2014, NASA celebrated the Cassini spacecraft’s tenth anniversary probing Saturn and its moons. This joint U.S.-European venture investigated many of Saturn’s enduring mysteries, from its rings to its seasons. Cassini also revealed that two of Saturn’s moons, Titan and Enceladus, might support life. The mission’s Huygens probe peered through Titan’s thick Earth-like atmosphere and illuminated lakes of methane. Cassini also tasted the salty water-laden plumes of Enceladus, whetting appetites for future missions. To Linda Spilker, the Cassini mission accomplished what it set out to do: answer old questions and pose new ones. 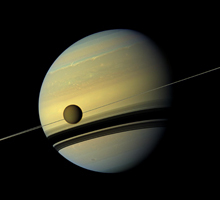 Spilker has studied Saturn for more than three decades, back when its rings were seen as bland sheets and Titan was an orange-shrouded enigma. As the mission’s project scientist since 2010, she now directs all of the spacecraft’s scientific investigations. 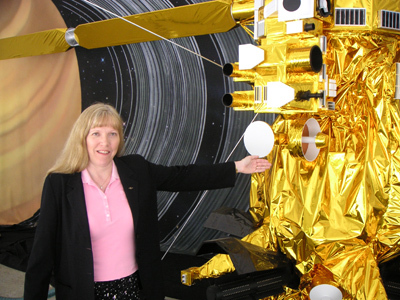 Spilker delights in the new ways the scientific community views Saturn thanks to Cassini, and she has high hopes for the last three years of its mission. In this “Grand Finale,” Cassini will make dozens of risky orbits of Saturn to address outstanding mysteries. When the probe runs out of fuel, mission operators will plunge it into Saturn’s atmosphere to avoid contaminating its exotic moons. Spilker reflected on Cassini’s discoveries and its final phase at the February 2015 meeting of the American Association for the Advancement of Science in San Jose. Before her remarks, she sat down with SciCom’s James Urton to discuss Saturn’s past, present and future as a destination for exploration. What made you want to become an astronomer? Growing up when I did, during the space race, was very exciting. I can tell you to this day where I was and what I was doing when Neil Armstrong walked on the Moon. I liked the planets and the stars. I remember looking through a little telescope at Jupiter and its moons and thinking about Saturn when I was in third grade. So, I thought, why not be an astronomer? 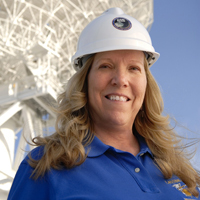 After you graduated from college in 1977, you started working at NASA’s Jet Propulsion Laboratory. Oh, I remember when I started at JPL. They gave me a choice. Did I want to work on the Viking extended mission [on Mars] or this new mission called Voyager? I knew a whole lot about Viking. I asked where Voyager was going. They said Jupiter, Saturn, and maybe on to Uranus and Neptune. I said, “Sign me up!” I wanted to be part of that voyage of discovery. And you started out studying planetary rings. What drew you in? The Voyager images. They were so different from what we expected! It just caught my imagination. We thought the rings would be three or four broad sheets of basically featureless material. But Voyager got there and recorded all kinds of structure, like ringlets and waves. We went from bland rings to an intricate dance of particles. The moons were launching waves within the rings and bending them. But there was so much we still didn’t know. At that point we had data not only with Voyager at Saturn but then Uranus and Neptune [both of which also have rings]. So I just kept working on the next planet with a ring system. "Seeing those jets and plumes from Enceladus was so tantalizing. Our views of where you could find life in the solar system have changed so much as a result." But you always came back to Saturn. Absolutely! It’s the best ring system in the solar system. Although there’s actually a new ring system you might have heard about. I’ll bet you mean the distant star J1407, which has a planet orbiting it with giant rings. Yes! Those rings are 200 times the size of Saturn’s rings and take weeks to move across the star. I always wondered how long it would take for them to find another planet with rings. If we have four planets in our solar system with ring systems, they must be common elsewhere. This is probably the first of many. How have NASA’s studies of Saturn influenced how we think a huge ring system like that would form or evolve? Well, the processes that formed Saturn, its rings and its moons are probably analogous. You mean this giant ring system might be governed by the same principles we see at Saturn? Right. And we even see gaps in the new ring system where you could form small or planet-sized satellites. Cassini has been a wonderful mission in enhancing our understanding of our own solar system. And now we can apply that to worlds beyond. Well, pretend you and I are having this conversation in 2003, before Cassini arrived at Saturn. What would we be saying that is no longer true today, thanks to Cassini? Lots of things. We thought we knew Saturn’s rotation rate. We don’t. We thought Saturn’s rings were made of individual particles, and we know that’s no longer true. We thought Titan might have a liquid methane ocean, which it doesn’t. Back then, Enceladus was a puzzle. We thought there was some kind of outgassing or emission coming from Enceladus. But we had no idea where it was coming from. Speaking of Titan and Enceladus, how has Cassini advanced what we know about these two moons? Certainly one major advance was the Huygens probe, which landed on Titan and unveiled what its surface looked like. Those pictures of Titan looked so hauntingly familiar and so much like Earth, with the [methane] river channels. We know now there are lakes and seas of methane at the north pole of Titan. And methane plays the role on Titan that water plays on Earth. It’s really cold on Titan, but you hit that right temperature where you can have methane clouds, methane liquid, methane snowflakes and methane gas. And there’s also a [liquid water] ocean underneath Titan’s icy crust. But what Cassini discovered on Enceladus was a complete surprise. We saw jets and plumes. Cassini’s cosmic dust analyzer found salts and water. The salts tell us there must be a liquid water ocean in contact with a rocky core. Seeing those jets and plumes was so tantalizing. Our views of where you could find life in the solar system have changed so much as a result. They now include icy worlds like [Jupiter’s] Europa and Enceladus. And that’s so intriguing! What questions should a future mission ask about Titan and Enceladus? Cassini didn’t have the instruments to detect more than simple organic compounds. It would be great to go back with the right instruments and really ask if we see evidence of life on Enceladus. We’re getting free samples out of the jets and plumes! And Titan is so intriguing. Could you have some unique kind of biology on Titan as well? Landing a probe in one of the lakes or seas could be very interesting, or visiting that [liquid water] ocean underneath Titan’s icy crust. It wouldn’t be easy to get to, but you wonder what could be there. Going back to Saturn’s rings, how has our understanding of them changed? After Voyager, we thought the rings were young, and that individual particles [in the rings] went around bumping into each other. With Cassini we realized that most of the particles [merge] into larger clumps. They’re oriented like the rows in a marching band that go around the rings. [Clumps] form for a time then break apart, then form again and break apart. That was a fundamental change. We now think the rings may not necessarily be young and that collisions [among ring particles] may break them up. Imagine a snowball that you break apart, with all this fresh ice on the inside. That may be what keeps Saturn’s rings looking so bright and young, as we once thought. But they could be old. How long do you think smaller particles that make up Saturn’s rings join together before they break apart again? We don’t know. It could be a range from hours to days or even longer. Cassini has spent a decade studying Saturn, which takes 29 years to orbit the sun. It arrived just as winter solstice was ending in the northern hemisphere, stayed for the equinox and it will be there for the summer solstice. Well, what has Cassini taught us about how Saturn and its moons can change with the seasons? With Cassini, we’ve seen a lot of seasonal change. Pioneer and Voyager had flown by Saturn closer to the equinox. But when Cassini first arrived about two years after northern winter solstice, the rings were casting huge shadows that went pretty much all the way up to the north pole. And the shadows they cast [on the atmosphere] looked blue—this beautiful Neptune-like blue. As we got to equinox, the two hemispheres started to look more alike. Now as we’re getting toward northern summer solstice, the south is starting to turn that blue color. Equinox was the prime time to look at the rings. They’re only about 10 meters [30 feet] thick. With the sun edge-on toward the rings, if anything is sticking up above or below, then you see shadows. Just imagine there’s this “thin” ring and you start to put big marbles in it; they stick up above and below, and they cast the shadows you see. Do you know the height of these particles in the rings that get stacked up? They’re probably hundreds of meters tall. Had that been predicted at all? We had no idea. It took a spacecraft up above to see this unique [ring] geometry. Some of the ring particles could be even a few kilometers in size. Well Cassini has only a few more years to figure things out. What are your hopes for its “Grand Finale” mission? We’ll hopefully get the mass of the rings, which is uncertain by about 100 percent and affects how old we think they are. We also hope the “Grand Finale” may pin down Saturn’s internal rotation rate, which is key to understanding its winds and weather. To keep Cassini’s radioactive fuel from contaminating Titan or Enceladus, NASA plans to send Cassini into Saturn’s atmosphere at the end of the “Grand Finale.” What you will do to mark that occasion? [Pause] I think we should have a party. When Voyager flew by Neptune, we had a celebration. And for Cassini and Huygens, we should find some time to celebrate their achievements too. Once Cassini’s mission is over, what will you work on next? I’m part of a mission concept that is looking at going back to Enceladus. I’d really like to see that mission get started. But the mission is probably 18 or 20 years to get there. So, I’d be part of the team that would train the next generation to be ready when we get there. Then I’ll stand back and happily watch. © 2015 James Urton. SciCom graduate student James Urton catalogs his own science explorations at jamesurton.com.